This year, as usual since 2011, +Alessandro Bezzi and me taught some lessons during the course "Archaeology and Ancient History: Digital Archaeology, GIS in Archaeology" at Lund University, held by +nicolò dell'unto. We used the opportunity to update the presentation with which we always start the first lecture. Here below you can see its last version, done with impress.js (just click on the first slide and us the spacebar to navigate). The main topic is digital archeology (or "computational archeology", as it is also known in Italy). Initially we define five main operations that are common to any archaeological project: data acquisition, processing, management, analysis and sharing. The first three steps refer to the documentation work-flow, while the last three actions are related with the real research process (of course data management is in common with both of the phases). Thereafter we analyze each step, starting with data acquisition, which is mainly based on hardware devices. During this operation are normally registered two elements, points and pictures, in order to virtually recover what the archaeological excavation is destroying. With points and pictures it is possible to document objects (artifacts and ecofacts) and actions (basically the archaeological samplings), and their elaboration or, in some cases combination, allows the researchers to record lines, polygon, 3d surfaces and real volumes, to register also the most complex elements of the archaeological record (layers, structures, etc...). On the contrary of what happen with data acquisition, data processing is mainly based on software. Nowadays it can be divided into two orders of operations: standard procedures (raw coordinates elaboration, 2D photomapping, 2D vector archaeological drawing) and advanced techniques (3D restitution, volume calculation and 3D modeling). The very first and basic step to visualize recorded data is to elaborate the raw coordinates, registered with a total station or a RTK GPS, into a GIS readable code (e.g. CVS or WTK). Combining points and pictures is also possible to create georeferenced photomosaic, using a photomapping techniques (e.g. the metodo Aramus, the Khovle method or the newest Corte Inferiore method). Once obtained a complete georeferenced photomosaic it is possible to use a GIS to draw over the raster level, using one or more vector layers and to connect them with a database. Advanced techniques of documentation are more directly related with 3D and can be based on different methodology to extract morphological, topological and metric informations from one or more pictures (e.g. SvR, SfM, IBM, 3D photogrammetry, etc...). With these informations it is possible to calculate the real volumes of the elements of the archaeological records and use this data to reconstruct the depositional and post-depositional processes, using, when necessary, 3D modeling. Normally, during the different work-flows that can be involved in data processing, many kind of informations are elaborated with raster, vector and voxel graphic in 2 (x,y), 3 (x,y,z) or 4 (x,y,z,t) dimensions. The final aim is to set up a system which is able to handle such a variety of data and this system is the GIS. In fact GIS software, combined with DBMS, are extremely useful during the data management phase, exactly for their capacity to handle different kind of informations (as many as are the disciplines or sciences which help archeology in its task). The use of such instruments helps to optimize the research, especially in comparison with the traditional techniques, not only during data management, but also during the more delicate stage of data analysis (when most of the cognitive processes are involved). Among other things, in this fourth step, it is more evident the importance of using open source software and tools to maintain a continuous control on every single process of a study that can lead to the elaboration of new theories. Of course, not all the the analysis are equally sensitive under this aspect: for the simplest researches (anastylosis, building techniques, basic geomorphology, etc...) it is not strictly mandatory to know the source code of the applications, also because in these cases the main examinations are done directly by humans. On the other hand, for more complex studies (landscape archeology and Cost Surface Analysis, statistics, advanced geomorphology, etc...), it is very important to have a complete access to the formulas and algorithms used by the software in order to keep an human control and do not completely delegate to the computer, among difficult quantitative calculations, also more delicate qualitative investigations (in which the human operator is still essential). In this way it is possible to correctly study all the different informations collected during the archaeological research, considering, at the same time, future integrations (GIS is an open system under a temporal point of view). The last goal of data analysis is to share results with the (scientific and non) community, which is the best way to improve the archaeological discipline itself, especially exploiting the potential of internet. This lead us to the final step of an archaeological project (data sharing), which can follow different channels, like traditional publication, e-publication (e.g. webgis), exhibitions, etc... The most important thing, at least for scientific disclosure, is to grant a public access to all the informations used for the study (not only the filtered data, but also the raw data), in order to propose new hypothesis and (at the same time) give the all the necessary elements to verify them (no dogma, no authority principle). To summarize the meaning of this contribution, considering archeology as a science (empiric approach) and a humanity (speculative approach), we can see how computational archeology helps to improve the scientific (empiric) approach, which is often underestimated, granting a more objective data acquisition and processing respects traditional techniques, especially during the critical phase of the archaeological excavation. In fact, unlike scientific experiments, the archaeological excavation is unrepeatable, being the most destructive approach of the discipline (and, at the same time, the most important). QGIS 2.2.0 Valmiera has been released! In my opinion, one of the most interesting news is the possibility of exporting an image with WORLD FILE from print composer. I think this new option is very useful and simplifies the workflow in Aramus, Khovle or Corte Inferiore methods for the photomosaic creation. 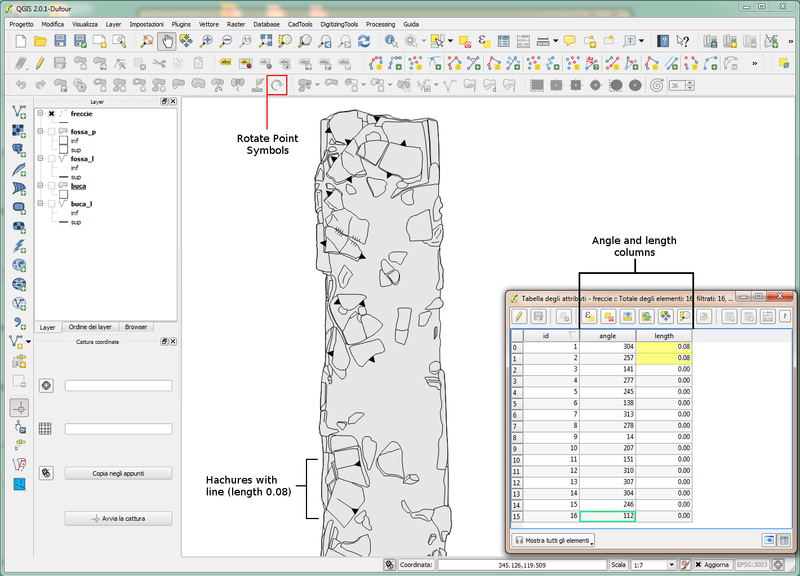 QGIS style tools for vector layers allow us to build custom symbols for archaeological drawings (plans and sections). 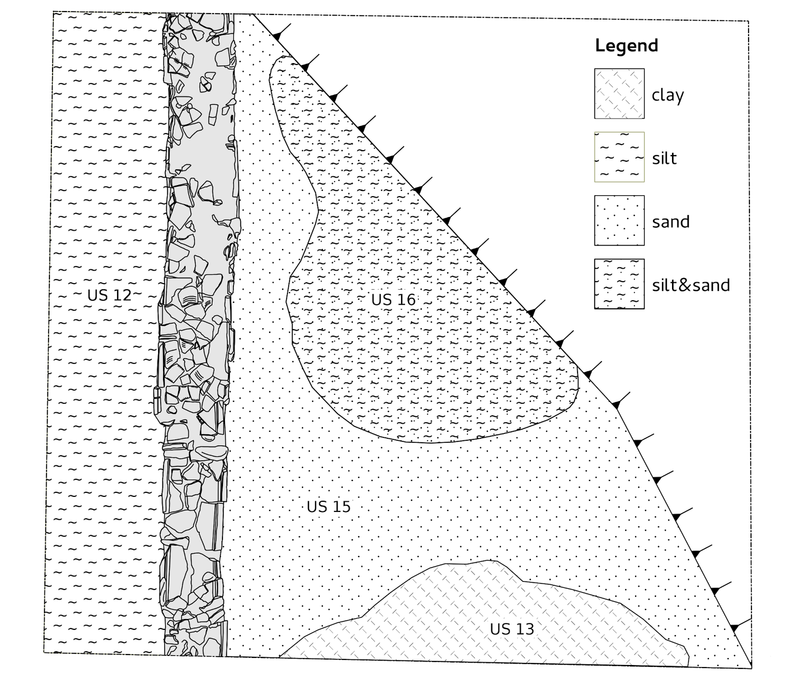 In this post I will present some preliminary examples of customizable styles for graphically representing hachures and soil texture (clay, silt, sand and so on). For each, the .qml style files are downloadable from http://www.uselessarchaeology.com/ (section programming): you can put them in your QGIS project and/or add to QGIS style manager for testing and modifying. Using vector styles makes the drawing more automatic and fast, because is no more necessary to draw manually each individual symbol. Furthermore, vector styles enable to change quickly the size of symbols when the scale changes: in such way there is no need to scale any single object. 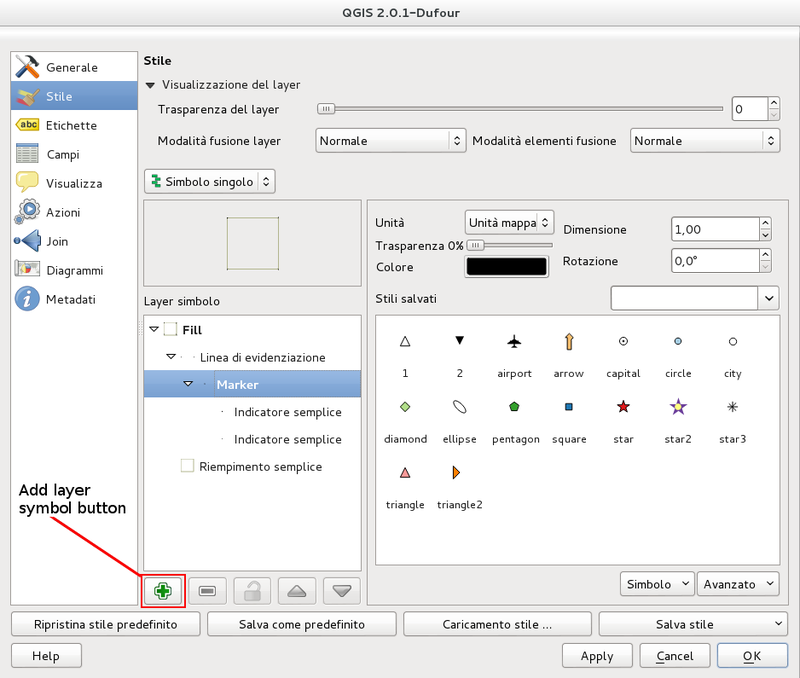 The bulding of a new style is managed by QGIS style window: with button “Add symbol layer” is possible to make a new symbol joining 2 or more individual symbols. All symbols settings (dimension, angle, offset, etc.) can be changed in the same window. 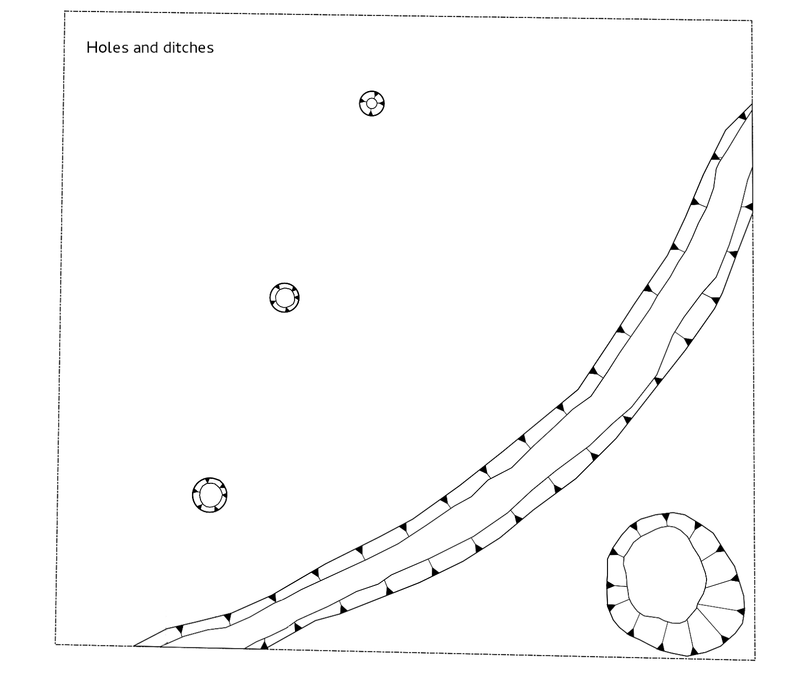 In plans, the edges of holes and ditches and the differences in level are represented with hachures. They are composed by an isosceles triangle and a line: the triangle marks the highest part of the feature, where the slope begins; the line represents the length and direction of the slope, with the end of the line showing the bottom of the slope. I created 3 different styles of hachure for point layers (hachure_pn), linear layers (hachure_ln) and polygon layers (hachure_pl). For representing the differences in level, for example at the top of wall, I create a shapefile of points connected to an attribute table with two numeric columns named “angle” and “length”: the first column records rotation angle of hachures, the latter records the length of hachure's lines (where lines are not required, the column value will be always “0”). Then I draw points in the place where there are differences in altitude, I load hachure_pn style, I rotate each points with “Rotate Point Symbols tool” (in advanced digitizing toolbar) and I write the line length I desire in attribute table. All settings are customizable: from “Marker – Advanced – Rotation field” you can set attribute columns for angle; from “Vector Field Marker” you can set attribute columns for angle and length; from “Simple marker” you can set triangle dimensions and offset: usually I give an offset that is half of triangle dimension for fitting the point to the line. Hachure_pn style can be used also for linear or polygon features. 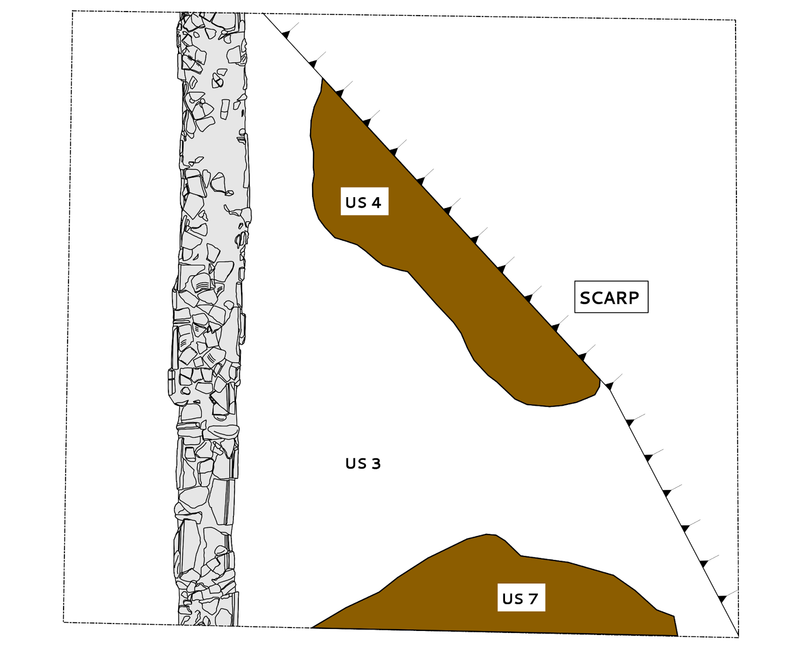 If I have to draw a scarp, I create a linear shapefile and I load hachure_ln style. It's possible to modify dimension of triangles, space between symbols, width of line, etc. 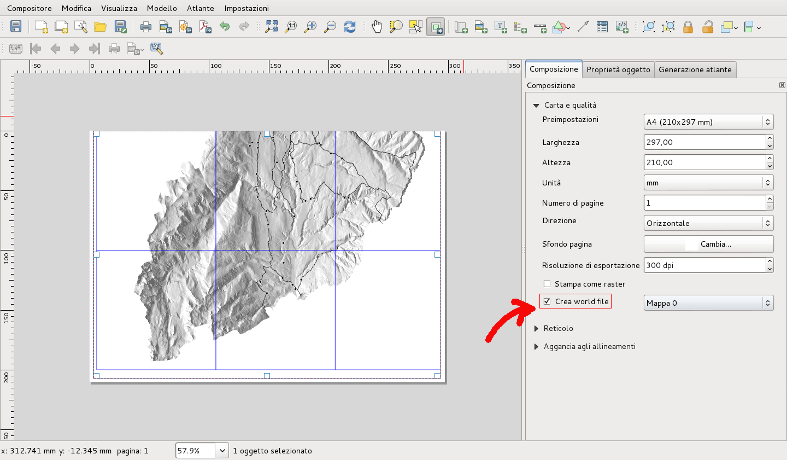 changing parameters in QGIS style window. For representing a ditch or a hole, I create 2 polygon shapefiles, one for top perimeter of the feature, one for the bottom limits. The top polygon is drawn by hachure_pl style and the bottom polygon is filled by white color: in the layer tree the bottom polygon must stay over the top polygon for covering the hachure's lines that exceed the slope. 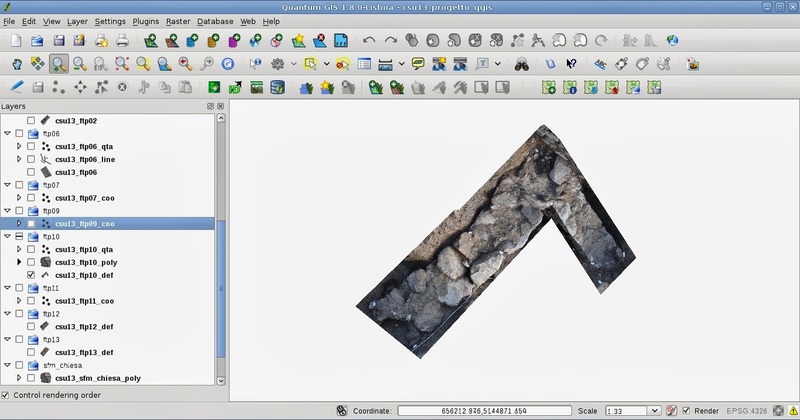 Like above, dimensions, space between symbols, offset and so on are editable in QGIS style window. I post some examples of archaeological layers filled with symbols representing soil components: clay, silt, sand, silt-sand. You have to pay attention to the settings of the these styles. Many symbols are set in map units and not in absolute measure (i.e. millimeters) to better fit the variation of scale during the display. For printing, all style settings must be changed according to the plot scale; for this purpose printing tests are recommended. Finally, I suggest to export in .svg format and modify the layout in Inkscape for adjusting the last details. In future I hope to post other examples of archaeological styles. But if you have other ideas or you want to contribute with your personal QGIS archaeological styles, we could create a shared library of archaeological symbols for QGIS. with 2048M my computer can export GIS-view till the value of 6905 width-pixel. More memory gives more resolution. 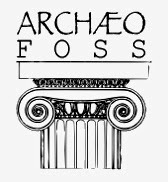 The IX Workshop ArcheoFOSS will be hosted by the Department Time, Space, Image and Society and Department of Computer Science, University of Verona. The workshop will focus on the use of free and open source software and on the opening and sharing of data related to archeology and cultural heritage. Key topics range from field research activities, to analysis and lab studies, to sharing and dissemination via web, including the presentation of excavation, research, study activities and of projects aimed at data processing and dissemination. - Projects focused on opening and disseminating archaeological and cultural heritage data. Proposals will be included in the program based on contents, quality of work and number of proposals received. The deadline for submissions is April 15, 2014 , at 24.00. In the last years we (Arc-Team) had to deal with an increasing number of missions or emergency interventions in high mountain environment, so that our team started to specialized in this new branch of archeology. The emergency interventions are caused by the preservation problems connected with the organic material of many archaeological finds, which, once freed from ice, begin to deteriorate very quickly. Moreover many areas of discovery are threatened by landslides of the rocks, which in few days cover the new empty space let by the glacier retreat. The main problems of an high mountain archaeological mission regard logistic difficulties. As an example, the video below shows the landing during the intervention we did to recover some ecofacts in the Oetztal (AT) in 2012. In this particular mission we had to deal with the limited internal space of the helicopter, which threatened to affect the number of "airborne archaeologists" and the amount of different equipment, necessary for the field-work. In fact, for this project (a fast one-day operation), we planned a strategy based on the redundancy of the instruments (in a similar way to an underwater archeology mission), so that it would have been possible to change methodology in case of unforeseen problems. More specifically or first plan was to georeference all the archaeological finds documentations, based on different techniques (2D photomosaic, 3D SfM models, etc...), using our RTK GPS, while the B-plan was simply to set up a local coordinate system with our total station. Following the first axiom of Murphy's laws (Anything that can go wrong — will go wrong), we could not use directly the GPS, because the area of archaeological interest was completely shielded by mountains and the satellite signal, as well as the radio signal from the base station to the rover, was accessible only on the top of the surrounding picks. To avoid this problem we climbed on one of these picks and placed two fixed points with the rover on the ridge which was closets to the area of interest (without any optical occlusion). In this way, at a later time, we could use the total station to document the archaeological evidences, georeferencing the directly on the UTM system. After this mission, we learned to not underestimate logistic problems in high mountain archaeological project and to study alternative solutions for emergency cases (mainly based on equipment redundancy). 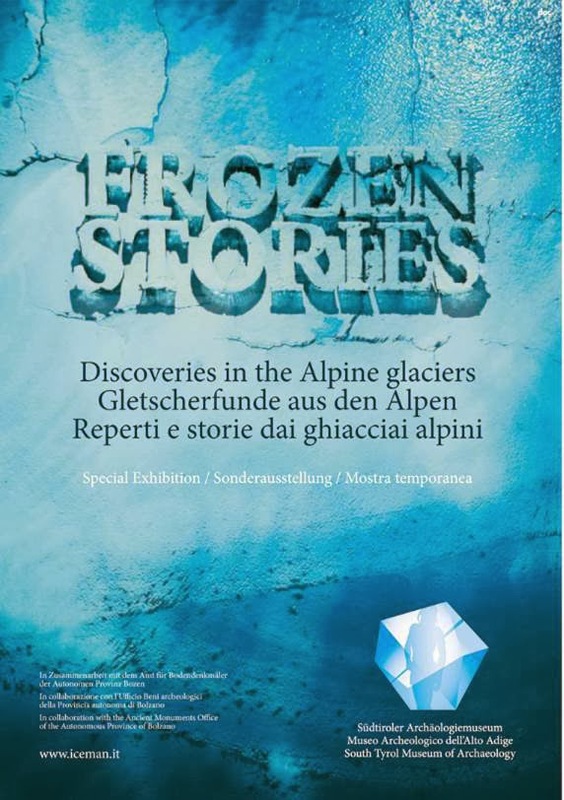 This long premise is intended to be an introduction to the main topic of this post: the exhibition "FROZEN STORIES - Discoveries in the Alpine glaciers", which will take place in the city of Bolzano/Bozen/Bulsan, hosted in the South Tyrol Museum of Archaeology (where is preserved the mummy of Similaun, Oetzy) form 22 /02/2014 till 22/02/2015. The Arc-Team contribution to the exhibition is mainly based on the Langrub Joch project, in which I did not participate directly, but that was lead by +Alessandro Bezzi, +Rupert Gietl and +Giuseppe Naponiello, under the scientific direction of Dr. Subert Steiner of the Archaeological Office of the Provincia Autonoma di Bolzano / Autonome Provinz Suedtirol. Maybe one of my colleagues will write a post about this project in the feature. The 2014 CAA Conference will be held at the “Université Paris 1 Panthéon-Sorbonne” Paris, France, from 22th to 25th April 2014. The program is now available and very huge: 27 sessions, 15 roundtables and 12 workshops have been accepted. Early bird fees until 28th February. Feedback when I will come back. In the meanwhile, take a look at the online Proceedings of the past CAA Conference. 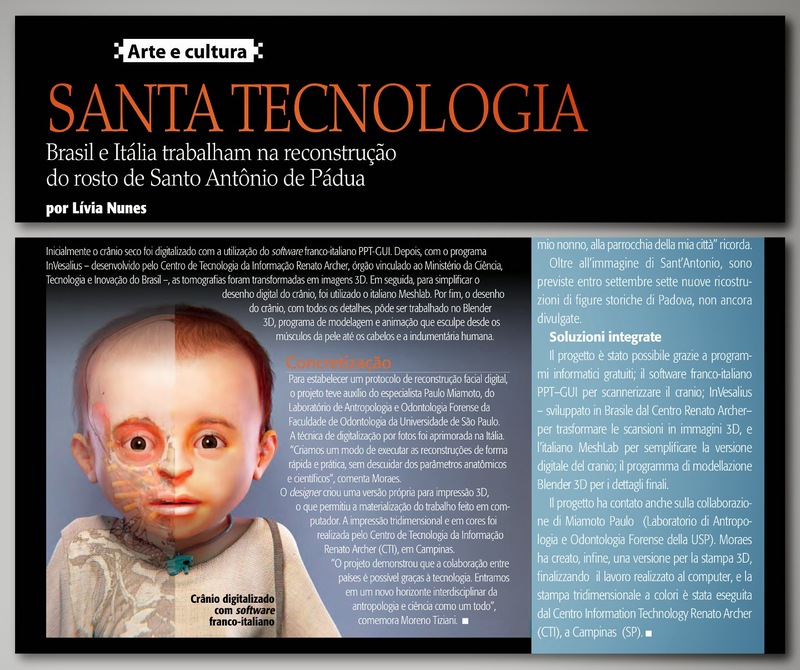 This post aims to address the main aspects of the project Il Volto di Sant'Antonio, which addresses the facial reconstruction of this historical and religious figure. 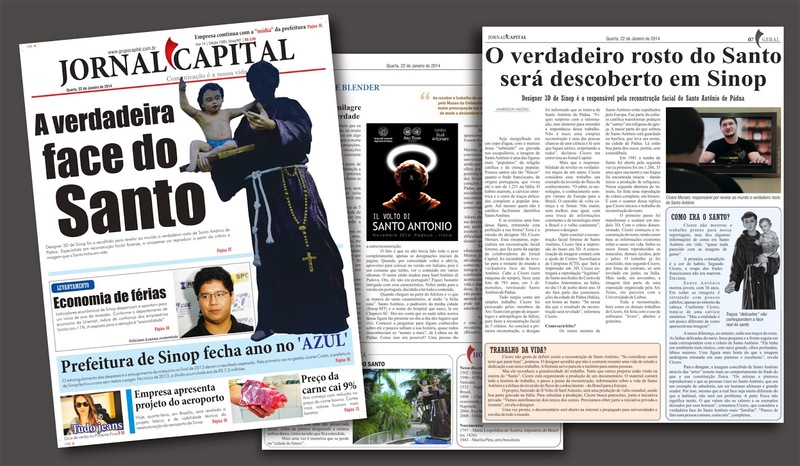 To illustrate this post we took the wide publication of interviews and news related to the project, in both printed field, online and television. 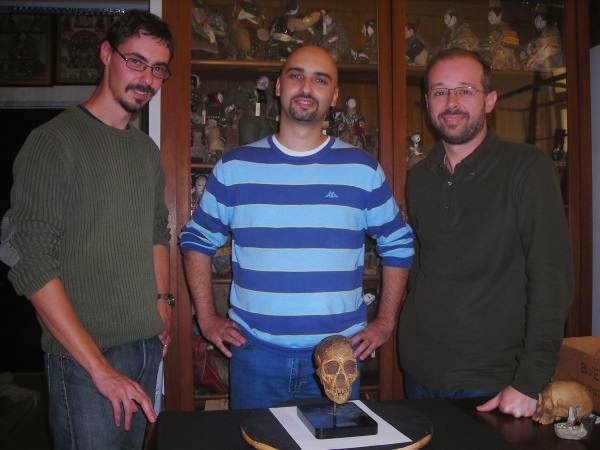 In 2012 started the Taung project, a partnership between the research group Arc-Team, the association of Italian anthropologists Antrocom Onlus (Dr. Moreno Tiziani), Department of Anthropology and Museum Studies at the University of Padua (UNIPD) represented by Dr. Nicola Carrara. In this project we reconstruct the face of a human ancestor, the Taung Child. It was an Australopithecus africanus fossil of 2.5 million years. The entire process was executed with free software and this gave us the basis for further study of reconstructions aimed not only human evolution, but also the historical figures. The studies continued and became a series of faces of hominids. 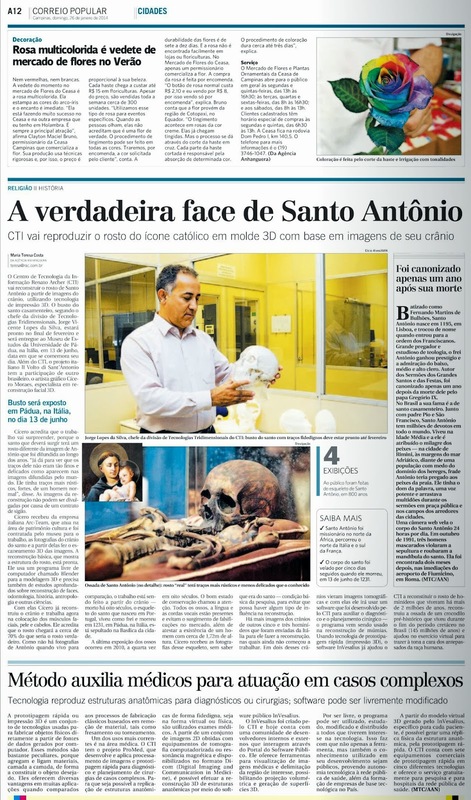 Between May and September of 2013 happened in Rosicrucian Egyptian Museum in Curitiba-PR (Brazil) the exhibition Faces of Evolution, with the facial reconstructions created during the studies related to Taung project. 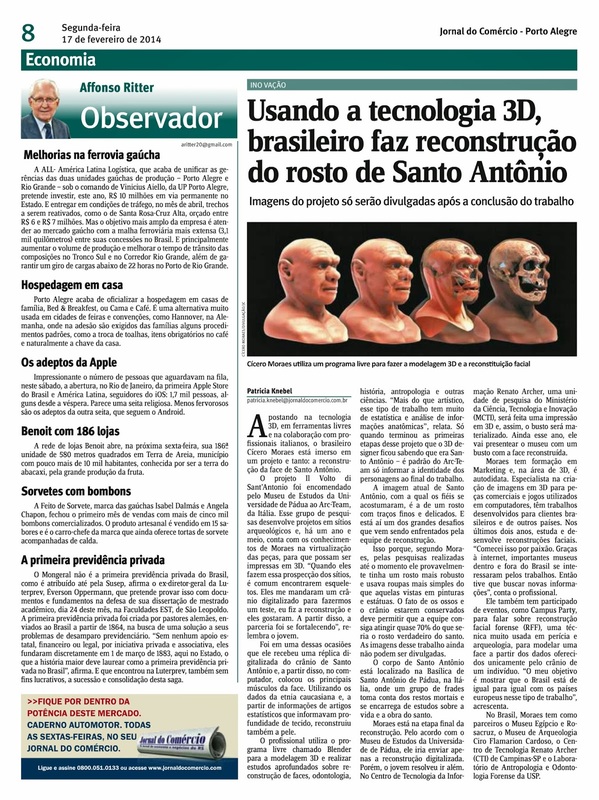 The exhibition consisted of replicas of human ancestors (hominids) scanned in 3D by archaeologist Dr. Moacir Elias Santos, from the Archaeological Museum Flamarion Ciro Cardoso, in Ponta Grossa-PR. The modeling of the muscles and skin ran on my own. I reconstruct digitally the facial tissues of those hominids, following a number of references involving both human anatomy, as gorillas, and chimpanzees. In view of the good results scientific and artistic of the work, there was an interest on the part of UNIPD to create an Italian version of the Faces of Evolution. Originally the stipulated date was: November 2014. To complement the exhibition, I was hired to rebuild a total of eight faces, three of them related to human evolution and the other five for a parallel exhibition on Italian historical personalities. The identity of the five individuals would be informed as soon as the basic reconstruction of each face was completed. When I finished the basic model of the first study, the results was sent to Luca Bezzi, the representant of Arc-Team Group from Italy, which was the bridge to the museum in Padua and Centro Studi Antioniani, an organization that takes care of matters related to the saint. After analyzing the results, the archaeologist Luca Bezzi asked me if I wanted to know who the skull belonged. Before he finished the sentence I replied affirmatively. He then sent a link to Wikipedia in Portuguese. This link appeared the name St. Anthony of Lisbon. I was quite impressed, but I confess I had not realized who it really was. I thanked him for the honor and follow for other reconstruction. The fact is that I had not read the post completely, only the top of the page. When, out of curiosity I opened it again, I put in the Italian version, it is a custom that I see content in multiple languages​​. The name then changed to St. Anthony of Padua. However, he was not Portuguese? I was quite intrigued by this characteristic. I then returned to the Portuguese version, I was decided to read the entire contents. When I reached the part of the folklore and saw that he was the matchmaker, so here I realized who I had rebuilt. Saint Anthony, the patron saint of my town (Sinop-MT, Brazil) and the name of the hospital I was born in Chapecó-SC (Brazil). It was also the name of my grandfather and the creator of Blender, Ton (Anthony) Roosendaal, rightly named after the saint. I realized that I knew nothing about this figure so popular. 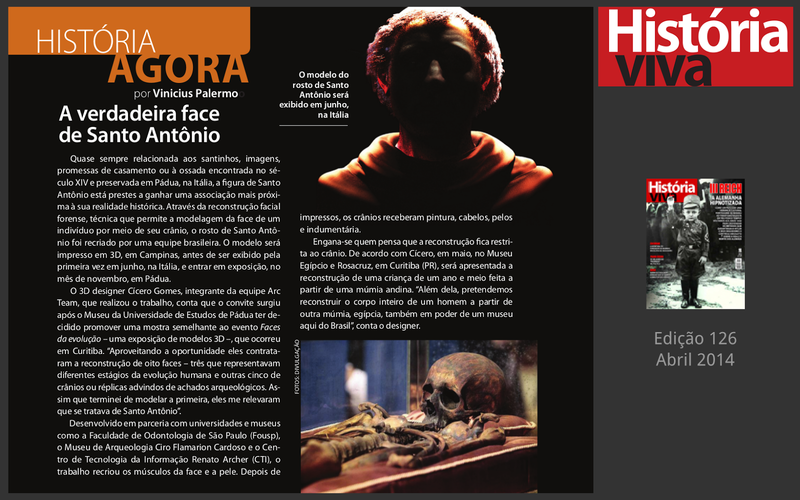 História Viva (Live History) Brazilian magazine - april 2014. I began to ask some acquaintances about him and few knew its history, almost all unaware the plus names, Lisbon or Padua. How was that possible? Such a so venerated and yet so unknown person. So I decided, as a good nerd, reading what appeared in front and watch all the movies that were directly or indirectly on the subject. I found out he was born Fernando Martins in 1195, he was originally an Augustinian and later he became a Franciscan friar. He was a university professor. He used his intellect in favor of faith, although initially it was not viewed favorably by St. Francis of Assisi, but after San Francisco officially allowed him to use the knowledge of books to convert people and soften hearts. I also learned that he died on the way to Padua in 1231, he was buried there and four times did the recognition of his body, the last in 2010. The first time, thirty-odd years after his death, they found the intact tongue, which was interpreted as a divine sign and even today they bring preserved in a reliquary. Faced with an opportunity that was perhaps unique in my life and the lives of my research partners, I had the idea of ​​turning this work into a documentary. In this documentary, we explanaremos entire reconstruction process based on free and open software. The documentary will put two seemingly opposing subjects into harmony: faith and science. People who nourish faith will enjoy seeing the face of the saint revealed and certainly identify with her ​​appearance, because it is a more robust and more human individual that the artistic different idealizations suffered over the years. People who enjoy science, will be presented to the demonstration of the technical implementation of a scientific methodology that will reveal to the world the face of a historical figure, based on statistical, artistic and archaeological data. 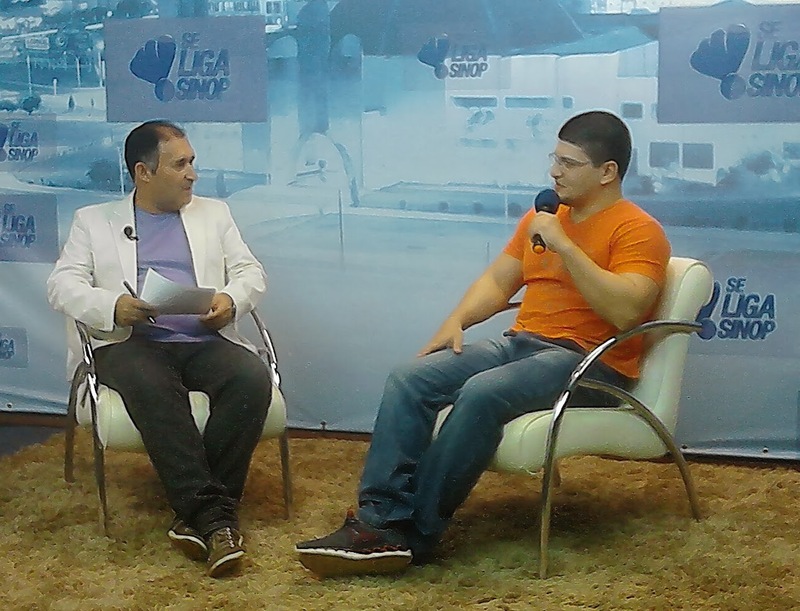 To put into practice the project, it was necessary to contact a number of partners, both commercial, as of research. To the press, got the support of BW Communications, a company based in Sinop-MT, which has in its portfolio, important personalities and events of the city and the region. To work filming and authoring media, we have the support of producer L8 Movies and agency Nova Mídia Advertisements, businesses with large awards in state and regional competitions for advertising. In science, we have a partnership of the Laboratory of Anthropology and Forensic Dentistry, Faculty of Dentistry, USP (OFLAB) by Dr. Rodolfo Francisco Haltenhoff Melani and Dr. Paulo Eduardo Dias Miamoto. 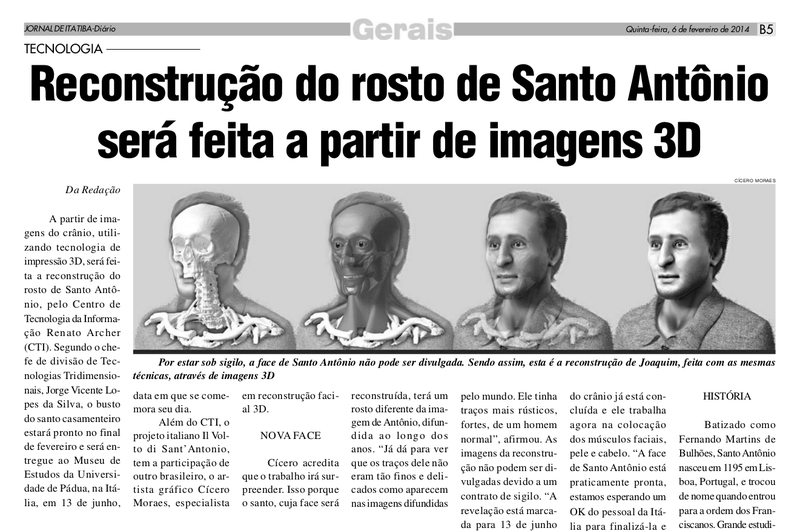 Thanks to this partnership, we could introduce the techniques of facial reconstruction with open software to academic and enhance them with the participation of researchers within a university respected throughout the national territory. With Dr. Miamoto, we developed a lot of research, ranging from the field of dentistry, passes through archeology and comes to medicine and veterinary dentistry in a profusion of interdisciplinary knowledge, including that we had already been awarded at an event at USP. 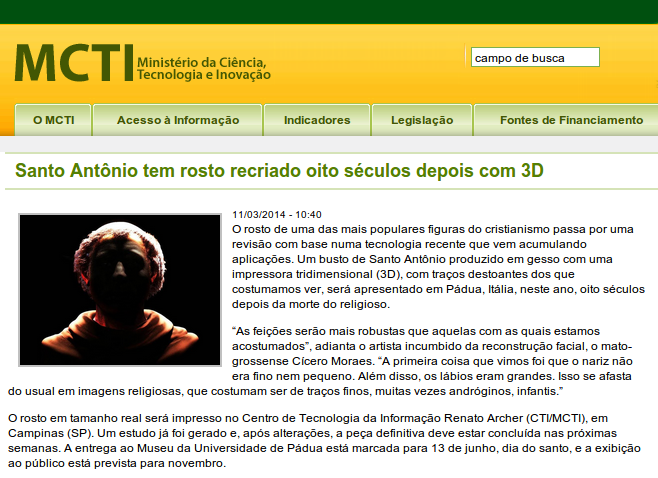 The Technology Center Renato Archer (CTI) is a reference in developing technology in Brazil. The InVesalius, an editor of CT scans and IMG2DCM a simple image converter in CT scans, are examples of two powerful free software at the Division of dimensional Technologies (DT3D) CTI. 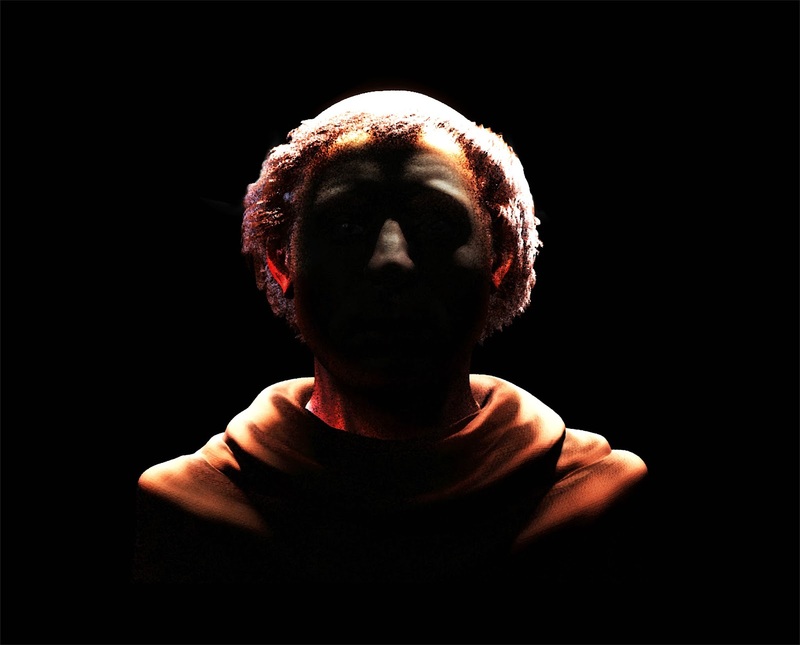 Thanks to this partnership, the bust of St. Anthony will be printed in 3D in color and real scale. This bust will be taken to Italy, where it will be delivered by me to the Museum of Padua during the days of the official festivities of the saint. Will be a gift not only from Brazil to Italy, but from Brazil to the world. All this will not be limited to bust donated, however it materialize all the knowledge displayed during the documentary. The big challenge we have in these next few months is to raise the cash required to terminate it. Although we have achieved significant portion of total trading volume needed to run it, we need yet a third of the final value. We hope to achieve it with the help of entrepreneurs initially Sinop and thereafter anyone interested in financing the project. 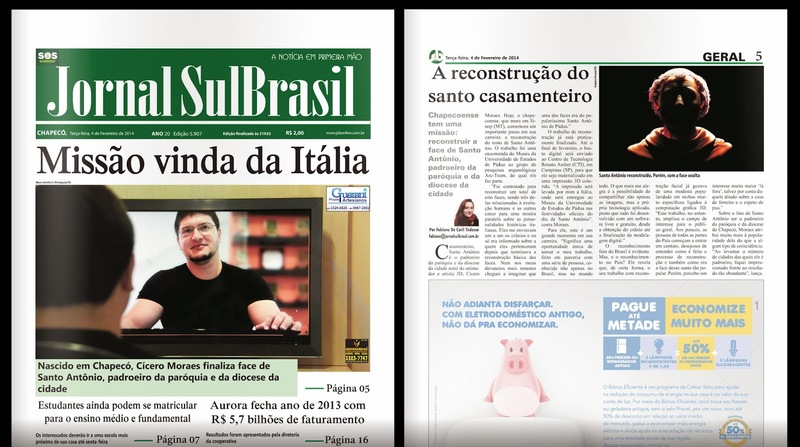 If all goes well, the material will be ready in November 2014 and will be presented in a Premiere will occur simultaneously in Italy and Brazil. The documentary will have no profit, what we want is to create an example of use of free software in practice. I understand that St. Anthony is a historical and religious figure who influenced crowds, and even if this job does not have religious biased, what you see is the miracle of the multiplication of knowledge, through work done by many hands, at various points in world, with the main goal of share with all the most information possible.